Guay Tiew (ก๋วยเตี๋ยว) literally means noodles in Thai. Besides eating rice, noodles are our go to food when it comes to satisfying our taste buds. There are many types of Thai noodles you can choose from when ordering at a local noodle stall/ restaurant. The choices can include egg noodle (Bah – Mhee/ บะหมี่), rice vermicelli (Sen Mhee/ เส้นหมี่), flat rice noodles (Sen Yai/ เส้นใหญ่ ,) rice fettuccine (Sen Lek/ เส้นเล็ก), glass noodle (Woon Sen/ วุ้นเส้น), and loads more that will blow your mind! 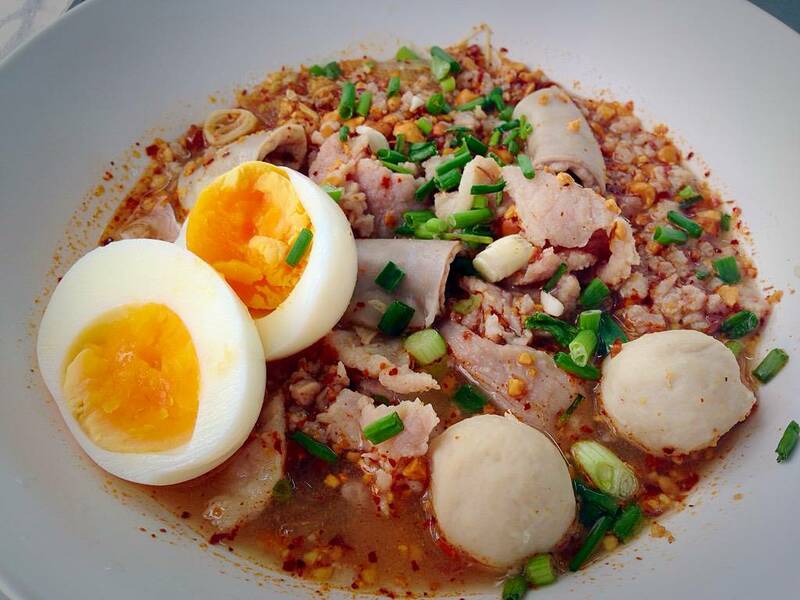 Here are some of the most common/ popular noodle dishes in Thailand. If you are here in Thailand, don’t forget to give them a try. They are just too delicious to miss! This type of noodle soup is quite varied and really depends on certain restaurants. When you say “Tom Yum” or “Yum” after ordering a noodle dish, it simply means ‘to spice it up’. Most of the time, the chef will finish up his/ her ‘ Tom Yum’ with ground peanut. My word of advice is that if you’re allergic to nuts don’t forget to say ‘Mai Sai Tua (ไม่ใส่ถั่วลิสง)’ right after ordering your noodle dish! Another locals’ favorite, this Chinese-inspired noodle dish is a combination of cinnamon, star anise, Chinese black soy sauce, and salt. The meat (pork or beef) is marinated and braised. The result is an aromatic, flavorful, and tender. Boy, my stomach is giving me a hard time already! Look Chin Pla means chewy fish balls. If you love fish dumplings, you should give this dish a try. 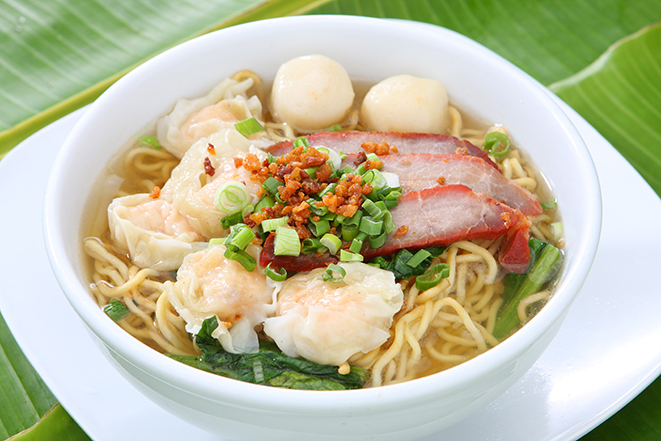 This noodle dish can also be featured with fried shrimp balls, fish dumplings, and deep fried fish slices, to name a few. This noodle dish, originated from China, is very much like Guay Tiew Look Chin Pla. Look Chin Kae is a combination of fish meat and sliced tofu. This noodle soup is Guay Tiew Look Chin Kae with a tangy twist. 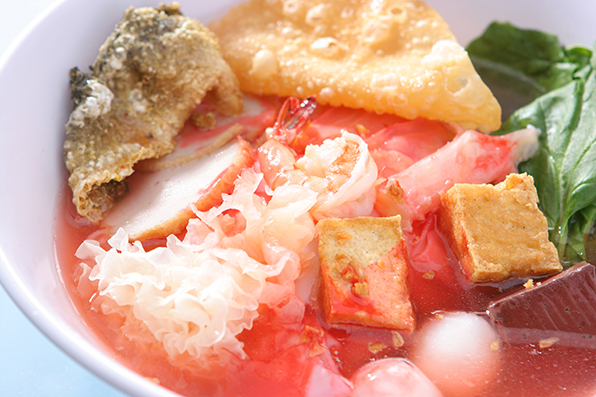 Instead of having all the Look Chin Kae, the chef will add seafood such as squid and jelly fish, onto the bowl. Then, he/ she will add a drizzle of the tangy pink sauce made with Chinese fermented tofu before adding the soup. Another famous Chinese noodle soup Thai people like. Mhoo Daeng is grilled pork, which is marinated in a special sauce and red food coloring. Many folks also like the dish without the soup. This dish is one of the most ubiquitous and can be found in most corners of the street due to its popularity. To put this dish into one sentence, it’s a combination of sliced duck meat on top of your favorite noodle with Chinese brown soup. Some Guay Tiew Ped places add duck feet, duck liver, duck entrails to the dish as well. If you are a big fan of duck meat you should never miss this bowl! 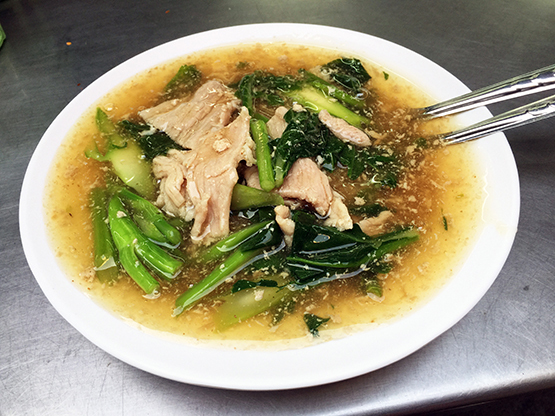 There are 2 types of Guay Jub, which are the brown broth and the clear broth. 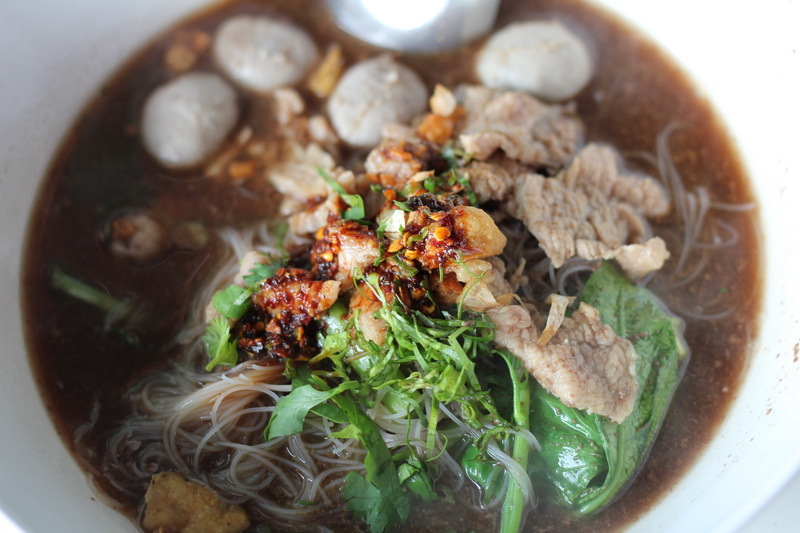 The one with the brown broth is similar to the one in Guay Tiew Ped (Duck noodle), whereas the clear broth is spiced up thanks to white pepper. Suki Naam is a Taiwanese-inspired noodle soup, adapted from Taiwanese hot-pot. 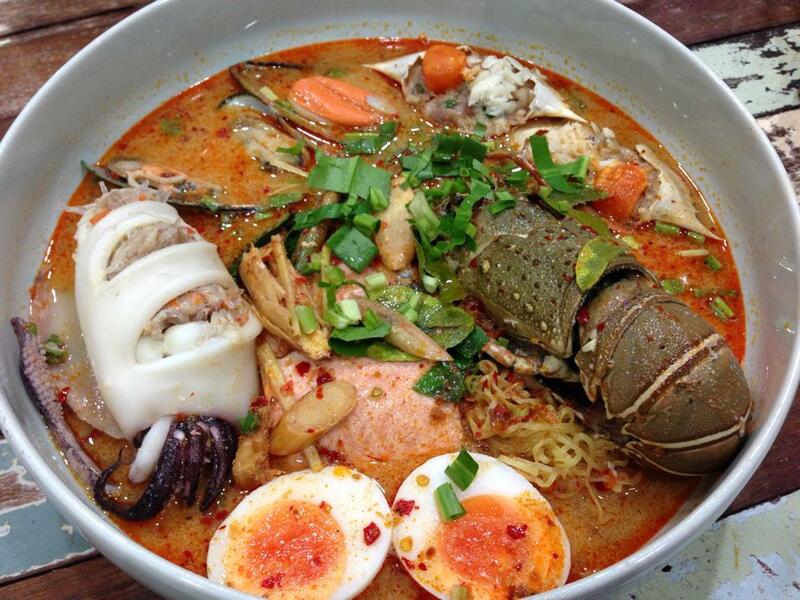 The noodle soup is cooked with seafood and other meats and egg is added at the very end of the cooking process. A special Sukiyaki sauce (made with pink tofu and white sesame) is served along with the noodle soup to add a zesty kick to the dish. This is a unique dish again originating from China. 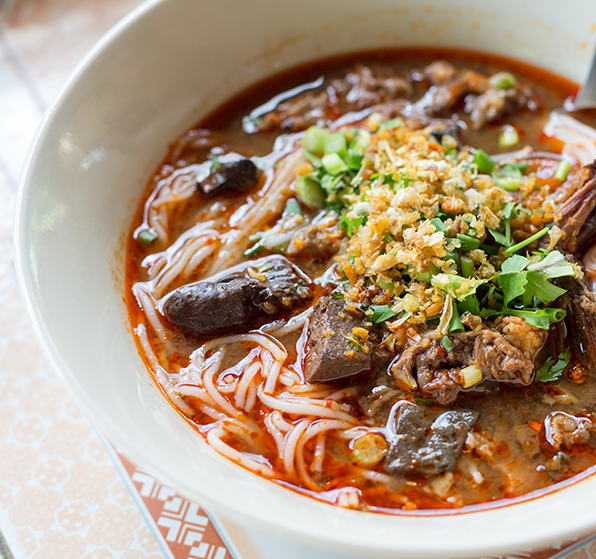 Raad Nha simply means “pouring over.” The chef will make the soup and thicken it before pouring it over the your noodle and meat of choice. TakeMeTour‘s tip: All these Chinese-inspired Thai noodle dishes can be found in almost every corner of Bangkok. However, Yaowarat or Bangkok Chinatown has it all in one place, as many locals flock to it when it comes alive in the evening. One of the most popular Thai noodle dishes among Thai people, pork or beef is the meat of choice just like Guay Tiew Mhoo/ Nuea Toon. It’s a well-combined bowl with a special sauce called Naam Tok sauce (made from pig/ cow blood). Guay Tiew Naam Tok is also known as ‘Guay Tiew Ruea’ (ก๋วยเตี๋ยวเรือ) since they were sold by many boat hawkers in many floating markets in the past. Gai = Chicken in Thai. Ma Ra = Bitter squash. The way they make the soup is like the brown soup in Guay Tiew Ped, but it’s more nutritious since there are extra ingredients, such as mushroom, galangal, and bay leaf, to name a few. Many Thais love this noodle soup because they love to feed on the odd-looking braised chicken feet! One of the most famous northern Thai dishes in general, This Burmese-influenced dish is very rich in taste and also very aromatic. The soup is made with from yellow curry and coconut milk. Chicken, pork, and beef are the meats of choice, but chicken reigns supreme among the locals. Personally, I would recommend this dish to anyone who wants to grand introduction to Northern Thai food. 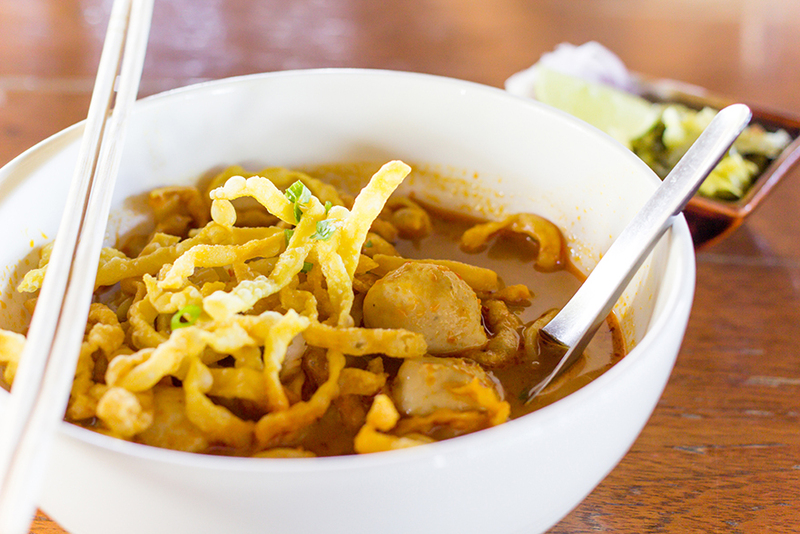 Last but not least, Khanom Chin is a angel hair-esque type of rice noodle favored by local Thai Northerners. The noodle soup contains pork blood jelly, grounded pork, pork ribs, crushed tomato, deep fried garlic, and vegetables. The dish itself is mildly spicy and a little sour. I bet these noodle dishes sound intriguing for you foodies. 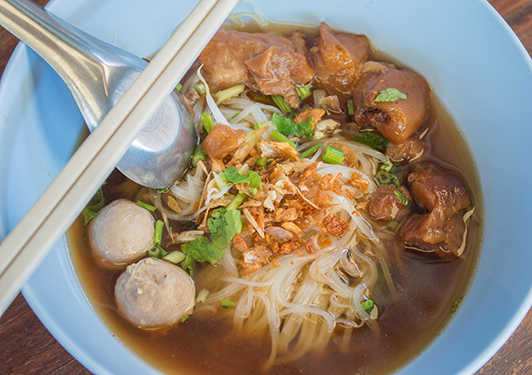 What is your favorite Thai noodle soup? Let us know in the comments down below!